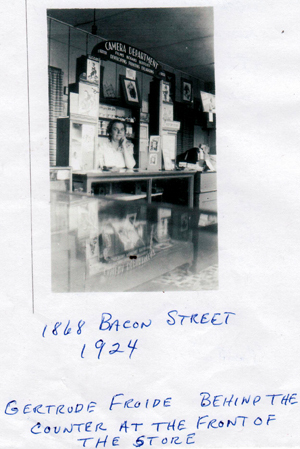 Billy Carlson and Frank Higgins laid out streets in 1887 and sold lots at a big mussel roast on the beach. They named the new town "Ocean Beach." (Carlson went on to become mayor of San Diego and later an inmate of a federal prison on charges of land fraud.) During the real estate bust of the 1890s, many buyers lost their lots and development stagnated except for a few houses used for vacation getaways. One of those who hung in there was David Collier who began promoting Ocean Beach and Point Loma in the first decade of the 1900s, He brought in electricity, some paved streets, and a street car line. 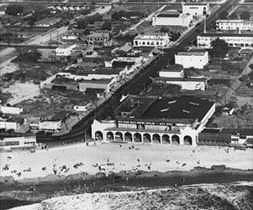 Collier (who was president of the 1915 Panama-California Exposition) and other developers touted Ocean Beach as a resort town, and in 1913 a magnificent (for its time) amusement park, Wonderland, was constructed at Abbott and Voltaire, on the sand. Unfortunately, it washed away in a few years and the center of activity shifted to Newport Avenue, where dance halls, a skating rink, a merry-go-round, and eventually a saltwater plunge took up the slack. During the 1920s, tourists continued to come, and home construction increased, making the beach town a hometown as well. OB already had an elementary school (since 1910) and a storefront library. In 1928 a new library was built across the street from the school, and the old Ocean Theatre near Benbough's Dance Hall was abandoned in favor of the new Strand Theatre in 1924 (it showed talkies!). John Mills, Jesse Shreves, and Alexander Pantages began an ambitious development of Sunset Cliffs, Lots sold briskly, but the 1929 Wall Street crash ended Mills' dream and launched Ocean Beach, along with the rest of the country, into the Great Depression. Construction slowed but did not stop during the 1930s. Residents survived with the help of OB merchants (such as Guido Faber) who extended credit for groceries and other necessities.The beach town continued to be a pleasant place to live, and by the end of the decade, government programs and the threat of war had eased the economic situation. In the 1940s, Ocean Beach was caught up in the efforts to end World War II. Street lights were painted black on the side facing the sea, and soldiers in bunkers were positioned at strategic points. Kids collected scrap metal, and the OB Women's Club provided snacks and entertainment to visiting servicemen, many of whom decided to make Ocean Beach their home after the war. The relative inaccessibility of Ocean Beach attracted the "hippie"element of the 1960s. Their free-wheeling lifestyle, drug use, and radical political stance put them at odds with the "old timers. There were protest meetings, marches, picketing, and angry exchanges.During this decade, the fishing pier was constructed. As the hippiedom of the 1960s declined into the "new age" of the 1970s, a general mellowing and tolerance of differences emerged, The hippies of the previous decade became the entrepreneurs of the seventies. Food co-ops, free schools, a community school, and new homespun businesses came into being. Civic organizations such as the Town Council, the Merchants' Association, and the Planning Board nurtured the friendly, casual ambience of Ocean Beach in the 1980s. Old traditions were revived and new ones begun: the Street Parade, Fourth of July Fireworks, and the Christmas Tree Parade, to name only a few. OBceans carved their feelings about their town via the Newport Avenue tile project. At the same time, local merchants found it increasingly difficult to compete with nearby chain stores. Antique stores began popping up in storefronts formerly occupied by variety, clothing, and department stores. In the 1990's, Ocean Beach continued the struggle to attract businesses that matched its village character. Sometimes it worked: the Newport Hotel was refurbished into an international youth hostel. Sometimes it didn't: the Strand Theatre had been unlit for over 3 years. The general feeling, though, was that the OB attitude that prevented the sewer outfall at Dog Beach and blocked increased housing density would prevail. In the early 2000's, Ocean Beach celebrated its 10th year as an award-winning Farmer's Market along Newport Avenue. The Farmer's Market continues to provide a weekly "get-together" for locals to keep in touch, listen to local music and buy regionally grown produce. Special events have been extremely successful and exemplify the local pride in Ocean Beach. Change comes to Ocean Beach but Ocean Beachchanges in its own unique way. Ocean Beach makes the news with a tragic ocean accident and a story of how the San Diego Lifguards came to be. Click here for the full San Diego Union Tribune article from May 1918, re-told by voiceofsandiego.org.